"Moist and delicious. It's one of the most favorite among friends and family. Use either one 8x8 inch pan or 4 mini-loaf pans." Preheat oven to 350 degrees F (175 degrees C). Grease and flour one 8x8 inch or 4 mini loaf pans. In a medium bowl, mix flour, soda, baking powder and baking soda. Set aside. In a large bowl, cream butter and sugar until light and fluffy. Add eggs one at a time, mixing well each time. Add vanilla. Add flour mixture alternately with sour cream. Mix until well blended. Stir in chocolate chips. 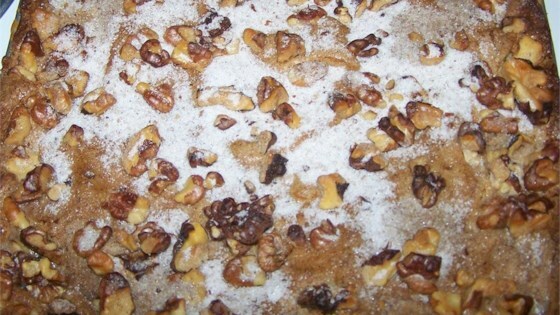 Make streusel mixture: In a medium bowl, mix walnuts, sugar and cinnamon together until blended. Pour in half the batter and sprinkle some streusel mixture across the pan (s). Add remaining batter and sprinkle streusel mixture on the top. Bake at 350 degrees F (175 degrees C). Bake 30 minutes for mini loaves and 45 minutes for 8x8 inch pan. Very good recipe. Cake is moist and rich. One thing the recipe does not mention which novice bakers, like myself, may not realize is to grease the pan. Other than that, delicious! My family thoroughly enjoyed this cake. Very moist and easy to put together. I made a double recipe and used my large loaf pans.